When Selina Padilla sits down in front of colorful pearls and pearl buttons, it is not long before something beautiful emerges from her skillful hands. Ahhhh, youth...maybe that is her secret, I am not sure, but certainly she is a natural at designing jewelry for the young and young at heart...hey, that includes all of us, right? Below is what Selina says about herself. What she modestly leaves out is her talent for music. A nine foot grand piano bounces with enthusiasm under her trained fingers. Add to that her powerful singing voice and wow....watch out Nashville! I am from Muscatine, Iowa, where I was born and have spent most of my adult life. But don't let that fool you! I love traveling, and was most recently in Romania, where I plan to move at the beginning of 2007 as a missionary. I like fashion, art, emotions, creativity, and uniqueness to name a few things. I don't consider myself very fashionably knowledgeable but I create what I like, and maybe others will like it as well! I hope to one day to be well educated about life, have helped and loved many people, and be married. I am excited to see where God leads me! 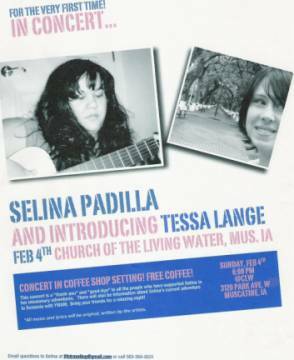 Selina and another friend of mine, Tessa, (who has modeled some of my button jewelry) recently blessed an enthusiastic crowd with their original songs on harp, guitar and piano. We would gladly enjoy more of their creativity...but too bad (for us) Selina now has moved to Romania to work with YWAM--Youth With A Mission. Our loss, their blessing. We already miss you Selina Padilla! Keep up with Selina's escapades in Targu Mures, Romania through her blog. Go to Kari's Contact page after Selina Padilla.